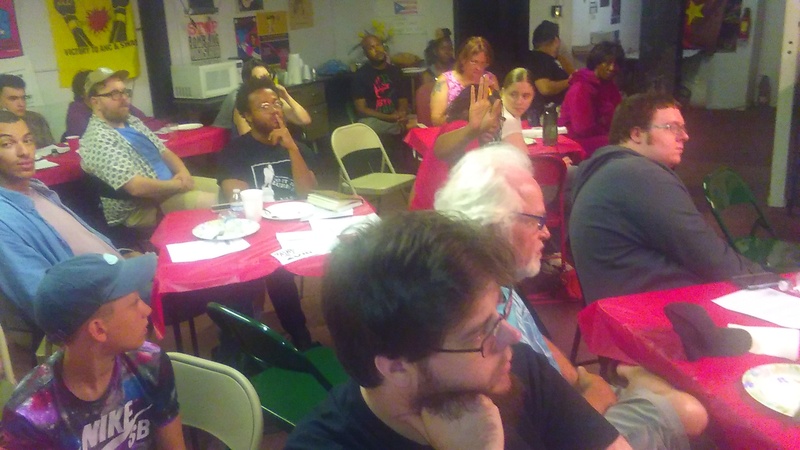 Note: This address was delivered at a Workers World Party Detroit branch public meeting held on Saturday September 16, 2017. 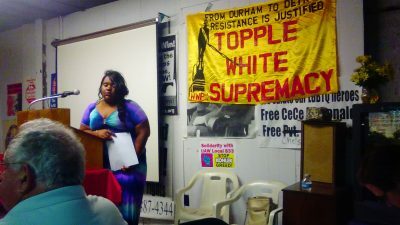 The gathering was entitled “Topple White Supremacy Do It Like Durham.” There was a report via Facebook from the Durham WWP Branch where 14 leading comrades and allies in North Carolina are facing felony charges for demolishing a monument to the Confederacy on August 15. Other presentations were given by Comrades Jamie Smedley, Mond Jones and Martha Grevatt of WWP Detroit branch. 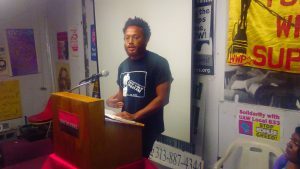 The meeting was chaired by WWP Comrade Kelly Carmichael of Detroit. Two guest speakers from the Detroit Black Youth Project 100, Lynx and Arthur Bowman III, also spoke at the forum. Congratulations to the Detroit comrades for their mission to Durham last weekend. Our party must be thoroughly committed to the elimination of racism and national oppression in the United States. Institutionalized racism and national oppression grew out of the rise of global capitalism and world imperialism. Today the U.S. is the leading imperialist state in the world. Consequently, the role we play here in the citadel of hegemony by finance capital will be critical in transforming this country and the entire planet. In Detroit we have been attempting to keep up with the rapidly developing situation. The attacks by the ruling class are intensifying on a multi-faceted level. We can safely say that all of the gains of the African American and Labor movements of the 20th century have been reversed. Nonetheless, more people are coming out into the streets ready to struggle against racism, class exploitation and police terror. From Durham and St. Louis to Detroit there is a burning hunger for justice, genuine equality and self-determination. A representative aspect of this emerging mood is the anger surrounding the expulsion of San Francisco 49ers Quarterback Colin Kaepernick as a free agent in professional football. This young talented athlete sought to express the mass sentiment in response to the systematic killings of African Americans and other oppressed people by the police across the country. On Sunday September 10, two members of the party and other friends were able to attend one of the demonstrations against the National Football League (NFL) and its racist policies held outside of Ford Field downtown. The Detroit Lions fans were entering the area in the thousands while people wanting to protest gathered at Grand Circus Park. As we approached the crowd of about 50 people in the Park the private security guards were telling them that they could not gather there because it was private property. Both of us immediately began to refute the guards who were African Americans. We told them to go call the police because they had no authority to tell us to leave a public park in downtown Detroit. A young police officer later appeared also saying that Grand Circus Park was private property. By this time most of the crowd had gone to Brush Street, the area leading into the entrance of Ford Field. Several African American police officers approached the person speaking into a bullhorn apparently telling him that the demonstration would have to be moved to another location. Here again the notion of private property in public spaces that are funded by the people continues to arise as an impediment for the expression of the views of the oppressed and working class. Finally, the demonstration settled at the corner of Madison and Brush in front of 36th District Court. People knelt in solidarity with Kaepernick and the African American people being oppressed today in the U.S.
What was interesting was the response of the ticket holders which largely consisted of white suburbanites sprinkled with a small minority of African Americans, some of whom were local politicians. Most of the fans acted as if they were indifferent to the demonstration. A small number of people expressed solidarity with the protests although they continued to stream into the stadium. Most strikingly there were a number of whites who conveyed open hostility to the anti-racist demonstration. This hostility is part and parcel of the overall atmosphere existing downtown along Woodward Avenue and in particular the eastern section of the area. We noticed at a bar on East Adams and John R they were playing a record by Lynyrd Skynyrd entitled “Sweet Home Alabama”, saying that the “southern man don’t want you around.” Clearly such attitudes being blasted in Detroit is an affront to the majority African American population and all people of goodwill and conscience. Later it was revealed that two African Americans attending the Lions game sat during the playing of the national anthem. A photo was taken of them and posted on social media with derogatory racial epithets attached. We are in full solidarity with those who are calling these demonstrations against the NFL for its institutional racism and exploitation of players. Are African people in the U.S. still slaves? Obviously, this is a rhetorical question that reveals that over 150 years since the conclusion of the Civil War, African people are routinely attacked if they speak out against their own oppression. We are encouraging sports fans and all anti-racist forces to continue these demonstrations along with a boycott of the NFL and their corporate sponsors. Most of the profits accrued by the team owners come from advertising. Tickets and merchandise sales also make a significant contribution to the firms’ economic viability. We can no longer continue to pay for our own exploitation and degradation. Kaepernick and any other professional athlete should have a guaranteed right to condemn racism in all of its forms. As it relates to the resurgent private property claims by security and law-enforcement agents deployed downtown, we are currently consulting with the Michigan American Civil Liberties Union (ACLU) lawyers about the illegal removal of demonstrators from public spaces. These arbitrary decisions three years ago during the bankruptcy prompted legal action by Moratorium NOW! Coalition and other groups which we successfully settled outside of the courts for an undisclosed amount in damages. The City of Detroit even drafted a new ordinance ostensibly clarifying the rights of the people to protest. These developments are not taking place within a vacuum. With the consolidation of corporate rule over the city these infringements on the civil rights of the majority African American population will become even more pronounced. All of the existing stadia, arenas and casino hotels are subsidized by taxpayer funds. These prestige projects were sold to the people and local politicians as mechanisms to create employment and tax money for the improvement of the municipality. Nonetheless, all three of the casino hotels have undergone bankruptcy. The much-championed tax revenues from the casinos opened 18 years ago became a source of legal contention during the bankruptcy when it was revealed that taxes from the casino firms were not going directly into the city coffers and instead being captured by a bond insurer in order to pay the usurious interests to the financial institutions. The conditions of the present configuration of the District Detroit complex are even more enormous. Little Caesar’s arena was not even voted on in a referendum by the people of the city. There was no debate except within the City Council whose majority of members are bought and sold by the capitalist entities that effectively run Detroit. Several court actions attempting to gain a seat at the table for the people were ineffective due to the lack of a mass movement specifically targeting the corporate racism that dominates the city. The stated aims of the District Detroit project are to link Midtown and Downtown with shops, restaurants, apartments and bars. These construction deals and financing are being carried out absent of any consultation with the communities being impacted. Hundreds of millions of dollars are being earmarked for this development while the neighborhoods, schools, water services, environmental safety of the residents of Detroit are being consistently eradicated. There were two demonstrations against Kid Rock as the opening act at Little Caesar’s on September 12. The first organized by the Michigan National Action Network (NAN) marched in the street up to the arena and then circling back around to head back to Grand Circus Park where it began. Another group of activists from the initial demonstration wanted to make a direct challenge to the corporate magnates of Illitch Holdings, the Downtown Development Authority (DDA) and the politicians whom carry out their biddings. A crowd of 200 youth and community people marched on the sidewalk back up to the arena to set up a picket of the Kid Rock event. Thousands of right-wing Trump supporters attended the event. A group of 200 bikers drove up the streets on the opposite side during the initial march and set up camp in front of the arena along Woodward Avenue. These bikers were relocated to the rear of the arena after the second march set out from Grand Circus Park to directly confront the corporate racists and their supporters in District Detroit. Just one day later on September 13, the opening of Crain’s so-called “homecoming” was held at the long-closed Detroit train station on Michigan Avenue. The purpose of the annual event as promoted by the corporate media is to bring back wealthy former residents to assist in the revitalization of the city. Such an outrageous news report is typical of the role of corporate media in the city. The television and newspaper outlets routinely treat the masses with contempt, promoting the notions that the billionaire ruling class will be the salvation of Detroit. This slogan points to the tens of thousands of water shut-offs in Detroit since the advent of emergency management, municipal bankruptcy, the Duggan administration and the Financial Review Commission oversight board composed of representatives of capital and the comprador political functionaries from City Hall. Those in attendance at the event could hear the chanting and speeches outside. Many left the party long before it was over. However, others stayed while a few came out in an attempt to talk with the demonstrators. Issues related to property tax foreclosures, corporate tax captures, police terrorism, the dictatorship of capital and the role of the subservient political operatives were addressed by the speakers. Our position is that there can be no genuine revival of Detroit without addressing the needs of the people for a moratorium on property tax foreclosures, the rebuilding of the public school system, quality housing for African Americans and working people, cleaning up of the environment and effective political empowerment of the masses. It is imperative that we continue to answer the corporate racists who are spending millions of dollars for public relations consultants every month in an attempt to foster a false perception of the actual conditions in Detroit. We must bring an anti-capitalist position to these debates taking place in the city and its environs. Our message cannot be muddled like some who are saying that they are not opposed to Dan Gilbert and the Illitch family, only the appearance of Kid Rock. They also eschew posters that portray the people of Detroit, who are 80 plus percent African American, as white. The disempowerment of the Black majority is a precondition for the escalation of the super-exploitative conditions under which we live. The dissolution of bourgeois democratic practice is being enacted in order to maximize profitability for the banks and multi-national corporations such as Bedrock, Quicken Loans and Illitch Holdings. Therefore, the upcoming World Conference of Mayors scheduled for late October should be viewed as a terrain of ideological and political struggle over the future of the city and its working and poor people. Detroit is by no means a viable model for urban revitalization in the 21st century. The real agenda of the ruling class is the further displacement, disenfranchisement and repression of the African American majority in Detroit. We need to provide an alternative program which challenges private capital and its control over our lives. We are for self-determination and social justice. Capitalism in its present modern-day form cannot grant these demands. Consequently, our ultimate objective is the realization of a socialist society which is controlled by the working class and the oppressed.